I have failed so spectacularly at minimalism and have now decided that my new found style is basically gold leaf everything and then put said gold leafed thing in some other silver thing. The first symptom of this illness was gold leafed antlers in a silver champagne bucket. My love for all things fancy has been growing over the past few months. Things escalated when I redecorated the dining room from something from a 1930s murder mystery to something out of a light French fairy tale. That's my way of saying it was heavy and dark then I painted a bunch of stuff and shoved it around. 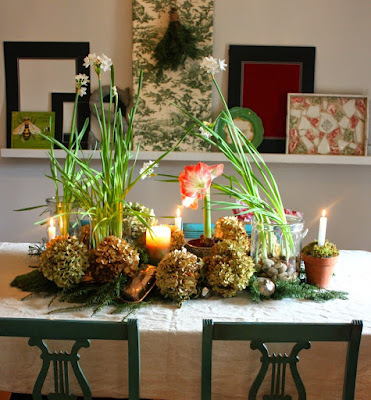 I had one goal for my Thanksgiving table: people had to have room to eat. In the past, I created tablescapes that were so elaborate that I was infuriated when everyone moved things to be able to put their plate down. Don't people have priorities? Please note that this photo was during my simplified Christmas of 2014. I know. I'm laughing too. The thing of primary importance was using my (I warn you this will sound pretentious) hand-dipped beeswax candles made from the wax of my own hives. If you stop reading now I don't blame you. So fancy. However, I do love a foil in design to keep things from looking stunningly perfect. I mean who in their right mind wants stunning perfection? Therefore there were only two choices for a table covering. One was burlap. But y'all I am over it except in very small doses and I do not want my house screaming FARMHOUSE! It may sometimes whisper English country cottage or Scandinavian rustic but only very quietly and when we are alone. 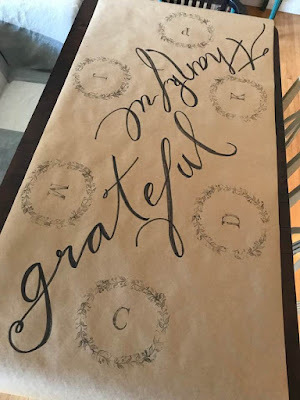 Okay, table runner. Y'all just buy a roll of craft paper and roll it out on the table. A normal person would be done then but my psychotic creative brain keeps yelling MORE! MORE! So I couldn't stop there. I happen to be in the possession of some beautiful decor stamps from Iron Orchid Designs and available locally at Me & Mrs. Jones. I decided to create a personalized place setting for each person. I used the wreath builder and their alphabet to create each design. You can use paint but for this, I love the look of ink. Everything in me wanted to gold leaf the letters. But it seemed a little Marie Antionette to gold leaf something disposable. Next up was writing out the words grateful and thankful across the table. This was achieved with an amazingly expensive and hard to find product called a magic marker. There's no special talent here. Just find a swishy font on Pinterest and draw what you see then keep going over it until you get the look you want. Easy Peasy. If you wanted to reuse this write a more generic word or phrase. The great thing about it was that I didn't care how big a mess anyone made. At the end of the evening, I just rolled it up and used it to start a fire. Burning things is my favorite way to recycle. Next up: Gold Leaf and other obsessions.